I may be more than a little hungry at the moment, however I must admit that the aroma of a barbecue grill firing up for a celebration or just a good meal is mouth-watering deliciousness. I'm probably one of the last to know that when it comes down to grilling, pork's got your grill covered. I'm breaking barriers and learning that cooking lean cuts of pork is one of the grilling's best kept secrets. Let's remember that where there is fire, we must always exercise the need for caution. This safety message us for everyone, those of us just getting into grilling and those "seasoned" pros. 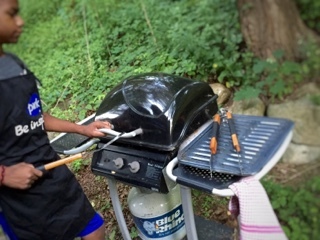 Take a few minutes to review these grilling safety tips to protect yourself, family and friends when grilling food. 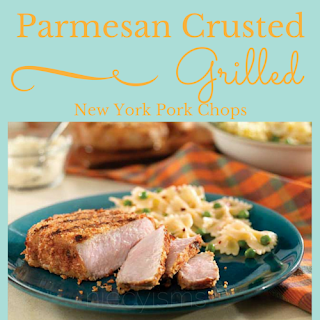 Here's my recipe that our family will be getting ready to put on the grill, Parmesan Crusted Grilled New York Pork Chops, another simple dish that the whole family will enjoy. * Brush pork chops with olive oil. * Season with course salt and ground black pepper. * Let seasoned pork chops stand for 15 - 30 minutes. * Mix Panko bread crumbs with parmesan cheese thoroughly. * Prepare a medium-heat fire in grill. * Place pork chops on the grill then close the lid. * Grill over direct heat for approximately 4 minutes. * Turn pork chops over to sprinkle with layer of Panko mixture. * Close lid to grill for an additional 4-5 minutes or until the topping is lightly browned on both sides and the internal temperature of the pork on a meat thermometer measures between 145°F (medium-rare) and 160°F (medium). * Remove pork chops from the grill and let permeate for 3 minutes. - Always remember that charcoal and propane grills should only be used outdoors located a safe distance away from the house, deck or patio. Clear away any tree branches or grasses that are within close proximity. - Children and pets should be kept away from the grilling area. - Clean grease or fat accumulation from the grill grates and trays. - Never leave a lot or cooling grill unattended. - Always use long-handled utensils to avoid contact, burns and splatters. - Keep baking soda nearby to control a grease fire and have a fire extinguisher available or keep a bucket of sand or a garden hose ready. - When using starter fluid, use only charcoal starter fluid without adding any other flammable liquids to the fire or hot coals. - Keep charcoal starter fluid stored away from any heat sources. - When using an electric coal starter, use an appropriate extension cord for outdoor use. - After grilling, allow coals to cool completely before discarding in an appropriate metal container. - Always inspect the propane tank hose for any leaks before use. To check for leaks, turn on the propane tank, and apply a light soap and water solution to the hose, any propane leaks will release bubbles. - If a leak is discovered, turn the tank and grill off to have the grill serviced by a professional before use. If concerned about a leak or grill safety, clear the area near the grill and contact the local fire department.